Wooly mammoths, saber-toothed tigers, six-toed horses, giant tree sloths, animal aliens all: watch out for the ICE age(nts)! Oh those deck chairs! Ah that Titanic! In another moment, another city, another Washington Square, you might have taught James Baldwin qi gongs. For a well-regulated militia, choose Milk of Magnesia! But no, Grace, that is not what happens. 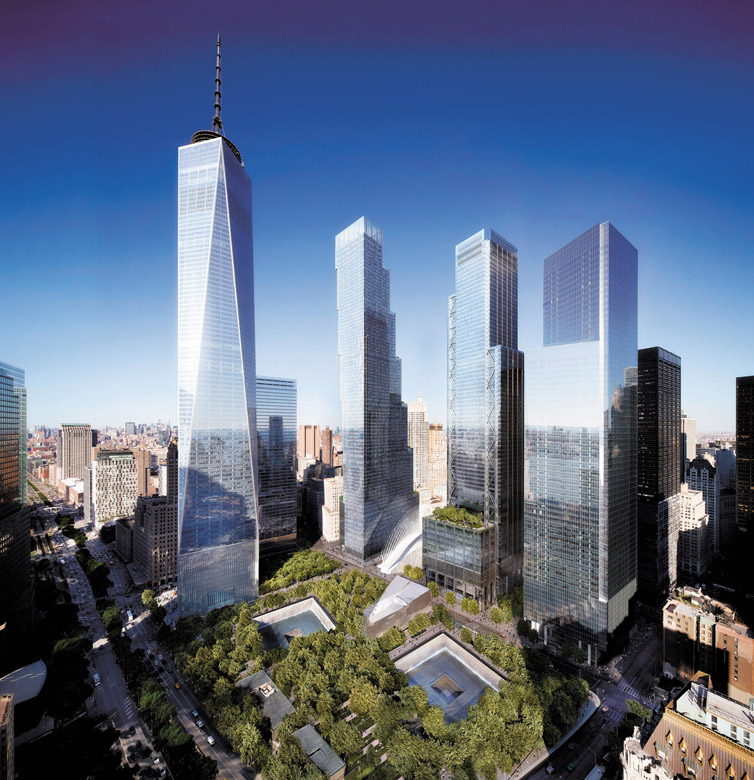 A rendering of the new World Trade Center buildings in Lower Manhattan, with the reflecting pools of the National September 11 Memorial in the foreground. Three of the buildings have been completed, including One World Trade Center (far left). Credit: DBOX/Little, Brown and Co. The above caption from image in Martin Filler, “New York’s Vast Flop,” NYRB, 3/9/17, p. 11. 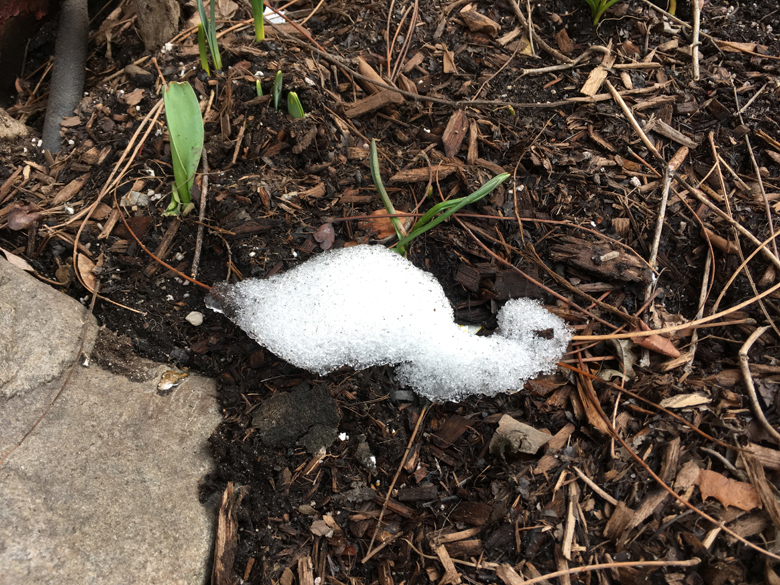 Whence emerges from an infinity of possible pixels this cyborgnetic extraordinary rendition of a scenario – one cannot call it a landscape – absent any visual coherence, Renaissancian or Oriental. Whatever the point may have once been, it has well and truly vanished. And what appears is multply-skewed, and seemingly not grounded in any known or intuited optical “laws,” or order. For example, the reflecting pools, which are not speculative, but actually exist, were designed and constructed to replicate the footprints of the twin towers: offset from one another, but exactly square, and parallel. It is not necessary to be stubborn in training [internal arts] boxing skills. If strength is sought on purpose, it can be restricted by strength. If qi is sought on purpose, it can be restricted by qi. If heavy ability is sought on purpose, it can be restricted by heavy ability. If light and floating ability is sought on purpose, it can be dispersed by light and floating ability. Therefore, in those with smooth training forms, strength can take place naturally. In those with harmony in the interior, qi can generate itself and the spiritual intention can return to the Dantian area and the body can be as heavy as Mt. Taishan. In those who could transform the spirit into voidness, their body can be as light as a piece of feather naturally. Cyber chicken qu’est-ce que c’est? Some disupute among musicologists as to whether the original title is “O’Neal’s Olfactory Reel,” or “O’Neil’s Old Factory Reel.” But whatever the truth of the matter, the tune’s a rare one. What’s in, or rather, on a palette? Comparing their pictures, one can only conclude that Constable snuck into Turner’s studio every night and stole all of his green paints, oil and watercolour, leaving JMW, like Regulus, completely in the light. And fade into the light of common light of day. Comedy central: Says Constantine to Pope Sylvester: Take my Rome… please! Archaeologists and art historians have argued over whether, in many a red and black figure depiction, Achilles and Ajax are playing dice or morra. The answer is neither. Nor are they not doing a jigsaw puzzle; they are collaborating on a mosaic – tèssara. As we approach… from the left, the large rectangular stone that sealed the tomb appears to have fallen in our direction, and Jesus’ gaze and [upraised] right arm are turned toward us. Incredibly, when we move toward the tapestry, the stone appears to move. When we stand directly in front… we will be amazed to see that the stone appears in the centre of the tapestry, Jesus’ feet are above the stone and his eyes are fixed on us. Things have ascended into chaos! It is useful to understand that the ideal of military strategy in China… is to be like water. Water connot be grasped, yet it is powerful; it has no form, yet can take the shape of a container. Water is flexible, adaptable and always changing and flowing. Whe one attempts to block it, it flows around the obstacle, never confronting it head-on. Water does not move in straight lines but rushes, spirals, and eddies unpredictably. It is substantial, yet when one attempts to grasp it, it slips away. Water is soft and yielding, yet it is powerful, like a pounding wave containing a heavy mass of water that can exert tremendous force. Pendant in the form of a siren. 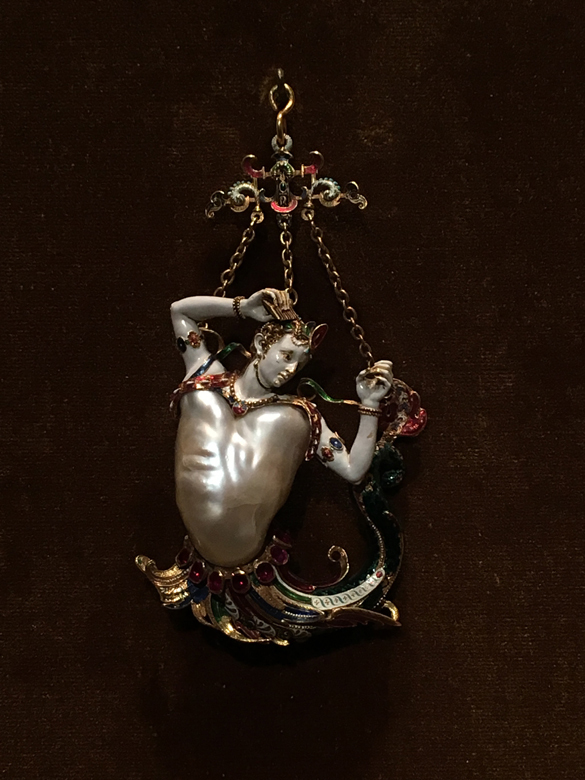 Baroque pearl with enameled gold mounts set with rubies. European, probably about 1860. Metropolitan Museum of Art.